They say that doctors usually get sued not for medical errors, but for communication problems (i.e., for being a jerkoff). Well, I was a jerk to my potential readers from the CBC, and I apologize profusely. Here I was, cheerfully watching the hits accumulate on my website (over 600 in two days), not realizing that the Kobo link to Terminally Ill was BROKEN. CBC Radio’s Ontario Morning had posted the free code, as a service to their listeners, and then readers came over here and got a 404. So I was thinking, “Oh, look! Readers! I love you!” and they were thinking that I was pulling a bait and switch. Some of them were contacting the CBC to tell them the code was broken. Business note to self: 1. Don’t anger readers, and 2. Don’t make trouble for the people who help put you in the Kobo Top 50. I managed to break both of those rules, inadvertently and repeatedly, for the past three days. I’m really sorry. So, for the next 24 hours I will post the code for everyone, and then delete it. Newsletter subscribers will get the code sent right to their inbox. Edit: The deadline has passed. The promo code has been deleted. However, if you are a CBC listener or a subscriber who missed the e-mail, contact me through olobooks [at] gmail [dot] com, and I will send you a code. 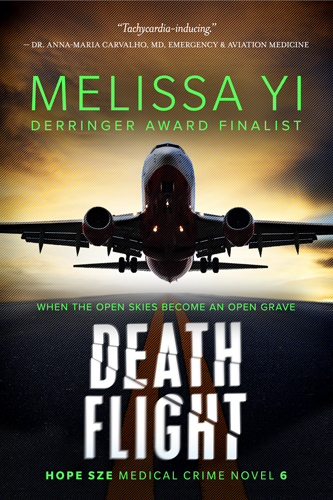 If that link breaks, for any reason, just search for “Terminally Ill” or “Melissa Yi” on Kobo.com. Once you get the code itself, some of you are having trouble entering it and getting it for free. You basically need to click “buy now” in standard checkout (or by clicking the cart icon) and enter the promo code. 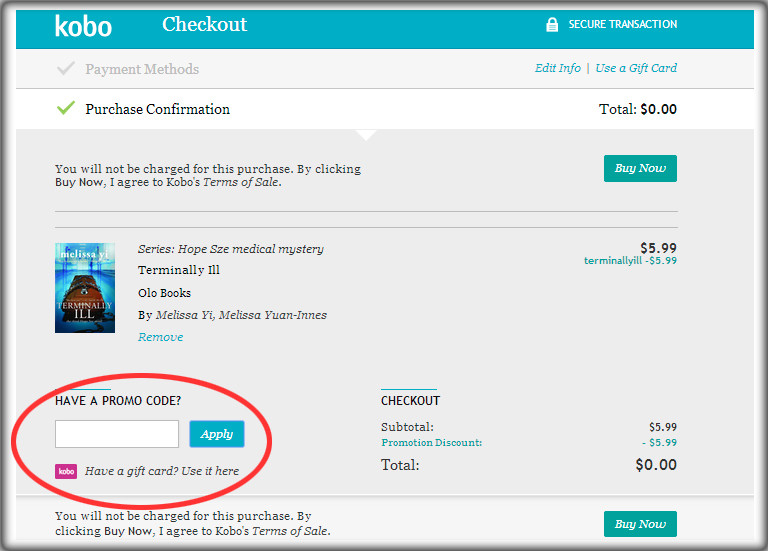 This link from Kobo may help. I also found a tutorial on the web. “Users have the option of clicking the Paypal option and getting to the PROMO CODE entry screen without ever having to enter a credit card or Paypal info. Note from me: If you absolutely can’t stand it any more, contact me at olobooks [at] gmail [dot] com and tell me what kind of file you need, and I’ll send you a file directly. Please note that I’m working heavily early- to mid-April and will be slower to respond at that time. It’s really better if you get a clean file from Kobo right away, if you can manage it. So I messed up, but at least I’ve got a phenomenal team behind me. I hope readers and the CBC will forgive me. Lisa Ellis liked this on Facebook. Brenda Carr liked this on Facebook. Thank you, Lisa! I’m glad you got a copy. You should be rewarded for all the important work you do with dogs! Got it looking forward to reading it..I just bought the first 2 and started reading and I have to say truly enjoying!!! Can’t wait to read more. Good luck with your continuing series! Kristen Leroux liked this on Facebook. Awww, thank you Melissa Yuan-Innes. Can’t wait to start i t! Glad you got it figured out. I know I had tried sending a message and reposting through the link with your amazing interview and it kept shutting me down 🙁 I thought it was just my computer. Andrea Shainblum liked this on Facebook. Oh, Rhonda-Lee, you heard the interview? How excellent! I don’t know if the code had anything to do with trouble with posting the interview, but thanks for trying to post it. If you ever want to, the Ontario morning link is here: http://www.cbc.ca/ontariomorning/episodes/2014/03/25/melissa-yuan-innes—author-and-doctor/, and the direct podcast is here: https://itunes.apple.com/ca/podcast/ontario-morning-from-cbc-radio/id447055175 Thanks for commenting. My friends have been amazing! It may have been the blog page and it just wouldn’t cooperate to connect with facebook or anything else for me. I just wanted to add my congratulations and to say what a fabulous job you did. (spoiler===> ) Oh, and I would have made the same Tweed confusion for sure! Haaaa! I know! I’d only heard about the Tweed connection to Elvis because I’d lived in London and Hamilton for school When I realized, I felt pretty silly, talking about Elvis’s black and white Jailhouse Rock shirt. Anyway, thanks for listening. Hope you get to download, if you want to (you don’t have to have a Kobo, you can read on other devices, too). And thanks for the compliments. Sounds like you’ve been busy too, working and running and honouring your dad. Thanks, yes very busy. I went ahead with the download and just assumed it would work for my e-reader of what brand I don’t even remember or where it is right now but it is in my account now so all good, excited to read it too! Yes, great, epubs should work on everything, including computers, so I know you’re all set. Thanks, Rhonda! People have been so nice! Debbie Mumford liked this on Facebook. Rebecca Senese liked this on Facebook.